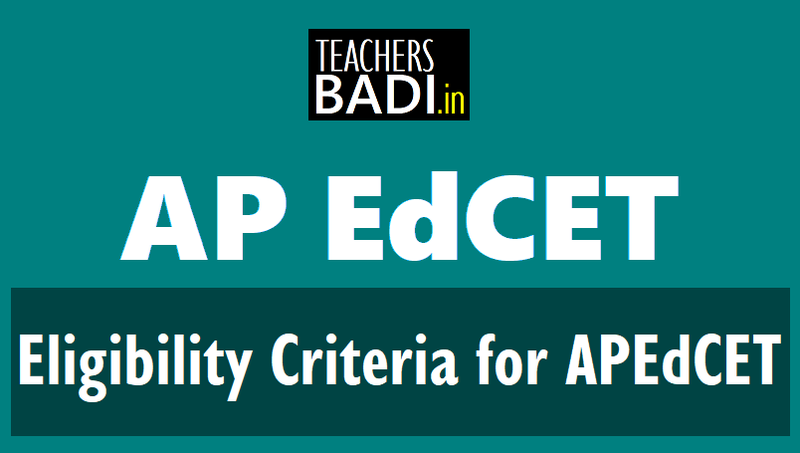 Eligibility Criteria for APEdCET 2019, Educational Qualifications for EdCET 2019: A Common Entrance Test, designated as Andhra Pradesh State Education Common Entrance Test-2019 (APEd.CET-2019) will be Conducted By Andhra University, Visakhapatnam on behalf of APSCHE ) ans TS EdCET 2019 to be conducted by Osmania University on behalf of the Telangana State Council of Higher Education for admission into B.Ed. (Two years) Regular Course in the Colleges of Education in Andhra Pradesh for the academic year 2019-2020. 1. The Candidates should be Indian Nationals. 2. The Candidates should satisfy Local/Non-Local status requirements as laid down in the Andhra Pradesh Educational Institutions (Regulation of Admission) Order 1974 as subsequently amended. Candidates should have secured a minimum of 55 % marks in B.E/ B.Tech with Science/ Mathematics as one of the subject or any other qualification equivalent there to, are eligible for admission to the programme. Note: As per the GOMS No: 92, the candidates who passed .B.B.S/B.D.S/B.A.M.S./B.L/L.L.B/B.A. (Languages)/B.O.L etc. and other such professional courses are not eligible for admission into B.Ed course. Candidate with B.A./B.Sc. /B.E/B.Tech. with mathematics as subjects or B.C.A candidates with Mathematics at intermediate level as a group subject. Candidates with B.Sc /B.E/B.Tech who have studied Physics and Chemistry or Allied Material Sciences (Physics and Chemistry) at intermediate level as group subject. Candidates with B.Sc./B.Sc. (Home Science) who have studied Botany and Zoology or Allied Life Sciences under Part -II group subjects or B.C.A. candidates with Biological Sciences at intermediate level as group subject. All candidates with B.A./B.Com./B.B.M. or B.C.A. candidates with Social Sciences at intermediate level as group subject.